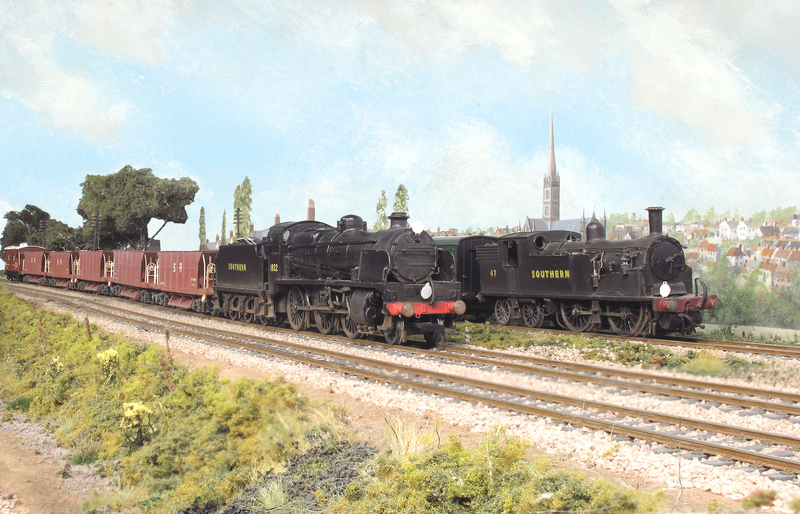 Maunsell 2-6-0 N1 class 1822 heads west on a freight service. 1822 has been converted from a Bachmann N Class with modified front end and valve gear. The first four wagons are banana vans piped with steam heating to help ripen the fruit. 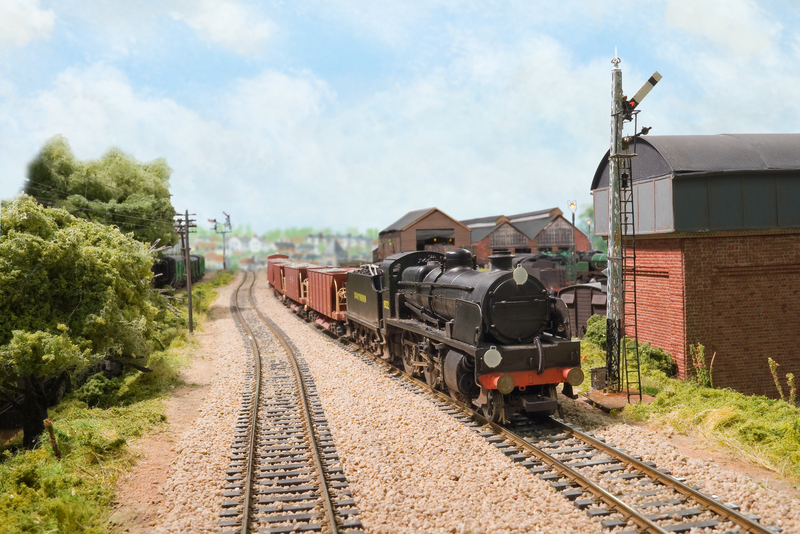 A Maunsell N1 class, a modified Bachmann model, hauls ballast train past the sheds coal stage. The SR Diagram 1774 40T hoppers are modified LIMA wagons on new bogies and other details. Salisbury Cathedral can be seen in the background. N1 No. 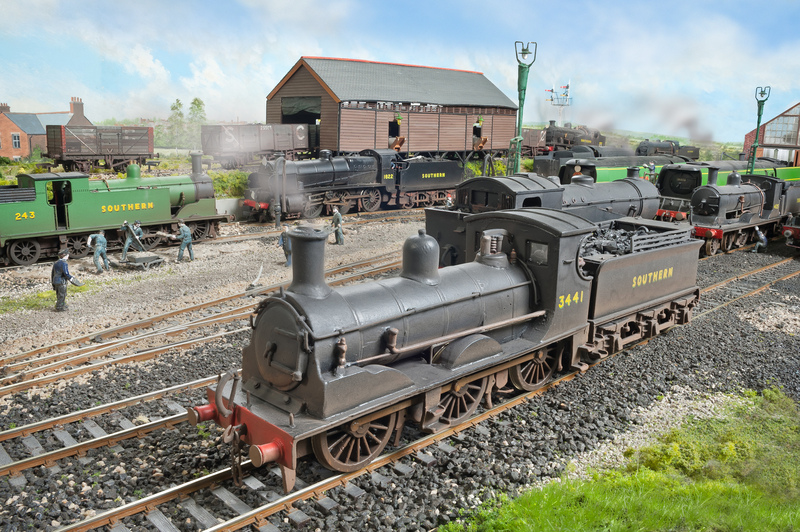 1822 heads past the shed at Fisherton Sarum. The N1 is a conversion from a Bachmann N class. M7 class No. 47 sits in the carriage siding. H16 class 4-6-2T tank No. 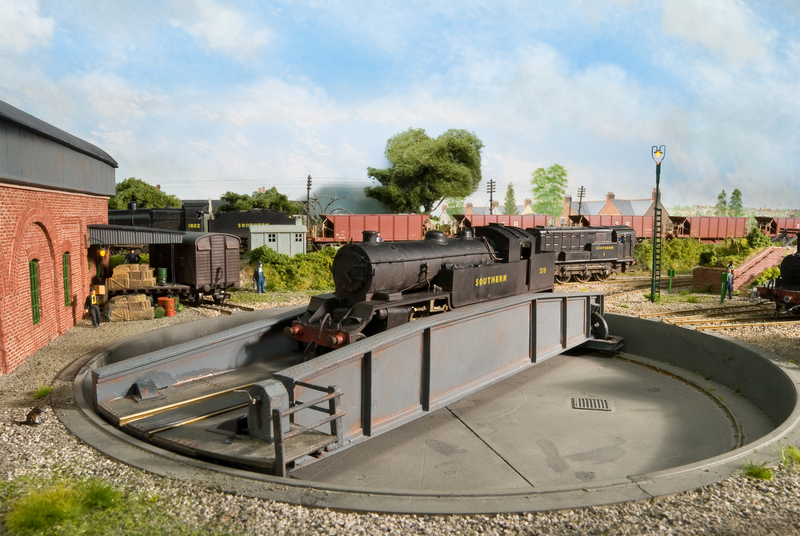 519, built from a Falcon Brass kit is turned at Fisherton Sarum. She must have been borrowed on a freight turn from Feltham. N1 class 1822 passes by on a ballast train in the background. Adams 0-6-0 0395 class number 3441 sits awaiting its next shed pilot turn. 3441 is built from a DJH kit. In the background N1 class 1822 is at the coaling stage. 1822 has been converted from a Bachmann N Class. Drummond 0-4-4T M7 No. 242 is one of the 6 painted in Malachite Green after the war but is one of those that were unlined, she is a repainted Hornby model. N1 No. 1822 heads west past the shed at Fisherton Sarum. The N1 is a conversion from a Bachmann N class.